“Get down from that tree! We don’t have time for a trip to the ER today!” I holler my no-time-for-contingencies mantra a dozen times a week. Maybe more. Of course I don’t mind the Littles climbing the magnolia tree—it’s truly the best climbing tree around. It’s when they scurry past the two-story roof line on days with no margin for the unexpected that I cringe. This week, it’s me with the ain’t-nobody-got-time-for-that dilemma. I lost my glasses. Not cheap reading glasses from CVS, my real prescription glasses. The ones I need to, you know, see. I’ve searched high and low like a mad lady. I retraced my steps through the grocery store (for the third time this week) looking for my spectacles. I found it slightly comforting when the HEB clerk at the lost & found brought out a large plastic bin filled with an eclectic array of eyewear. At least I wasn’t the only fool with specs gone missing. Alas, my glasses were not on the isle of misplaced accessories. There was a fancy schmancy gold watch if perhaps you have misplaced yours. I drove through the same lane at bank where I cashed a check yesterday slowing down imagining my glasses flew out the window when I reached for the plastic tube thingamajig. That side trip was clearly a waste of time. Obviously, I didn’t walk through the drive-through window at the bank and accidentally drop my glasses, but I was trying to be thorough. Nothing at the pet store or the dry cleaners. Or the pharmacy. Essentially I ran the same errands two days in a row this week. On the bright side, and there always is one if you look hard enough, I had frozen green beans in the freezer. It’s the little things, right? Three little ingredients and voilà- the most easy, delicious side dish of vegetables you’ll ever make. 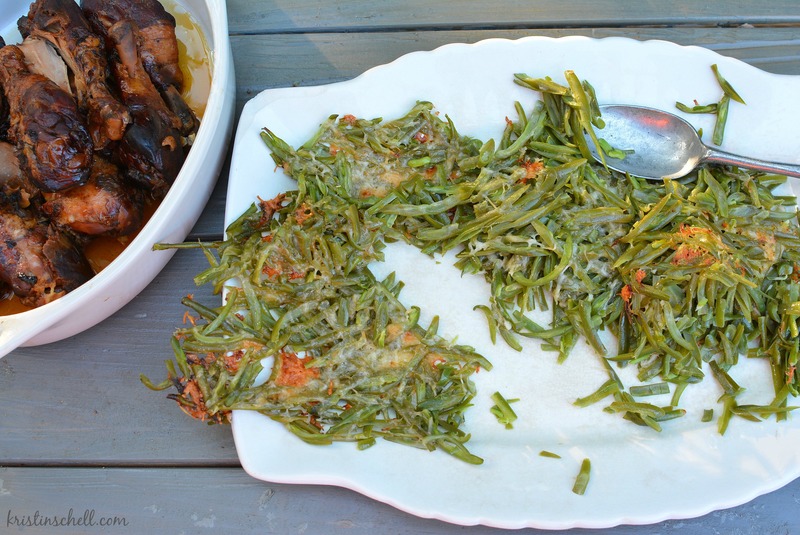 Frozen green beans—I like the haricots verts, the little skinny French beans, coconut oil, and parmesan cheese. Roast ’em up for 20 minutes and watch ’em disappear. Kind of like my glasses. Quick and oh so yummy in the tummy! Three ingredients and voila – veggies for supper. Preheat oven to 375 degrees. Line a baking pan with parchment paper. Spread frozen green beans on baking pan. Drizzle melted coconut oil. Toss to coat. Sprinkle parmesan cheese evenly over green beans. Bake for 15-20 minutes until cheese begins to turn golden brown. These look fabulous–and so simple. Thanks. And good luck with that seeing thing.